My kindergarten teacher mother had a favorite book which she would read to her group of five-year-olds each year. And to me. Repeatedly. And so I grew up physically imbued and psychologically branded by the tale of “The Velveteen Rabbit.” Not by the actual words and pictures of the story, but by the strange and eerie fear of all I suppressed. There was something about the narrative which cracked open a feeling I could not name, a queasy kind of terror and unease, a place I did not want to know or go, a nebulous, other-world that frightened me. But mother was so effusive in her enthusiasm and delight and would always exclaim – “This is my favorite book. Isn’t it wonderful!” that I would feel alternately confused and repelled while I hurried to nod in agreement and hoped we could just move quickly on to another topic. I realized recently that I could not conjure up one sequence in the tale of the Velveteen Rabbit. It was all a blank. I had successfully buried whatever horror lurked within its pages. And no wonder. When I “googled” the story I understood why I was confused and “creeped out” at too early an age by the points of gravity within the plot. This classic children’s book written by Margery Williams was first published in 1922 and for a “picture book” had an unusually profound and mystical premise. Yet it introduced concepts and fears a young child might not want to think about or encounter. Basically it is the story of a boy who receives a Velveteen Rabbit for Christmas which becomes his favorite toy and constant companion. The other toys scorn the rabbit because they fancy themselves “real” and one of them one day, tells the rabbit that “once you are Real you can’t become unreal again. It lasts for always.” On a jaunt with the boy in the nearby woods, he comes upon real rabbits who hop and jump about, and he knows for sure that he is just a toy. The plot takes a serious turn when the boy becomes ill with scarlet fever and thus unable to play with the rabbit. The doctor orders that all toys must be burned in order to disinfect the nursery and the boy is given a new plush rabbit for his trip to the sanitarium by the sea and forgets all about his special friend. While the Velveteen Rabbit waits by the bonfire for his demise, he cries a real tear and that incident brings forth a magic spirit who tells him that he was only real to the boy but now he can be real to everyone. (Presumably because he can cry.) 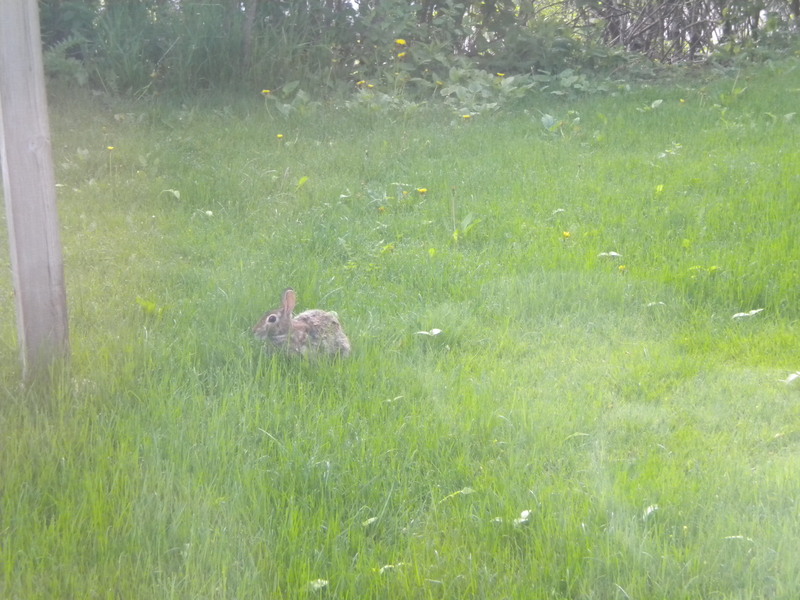 Thus he becomes a real rabbit and runs to join the other rabbits in the wild. The following spring the boy, now recovered, sees a rabbit hopping in the woods and thinks about his old companion. But doesn’t recognize him. Holy moly! Now I get it. No wonder I felt uncomfortable as a child. Small wonder I had to blot it out. This story is a serious downer told by a fear mongering boogie woman. Let me get this straight. The other toys introduce comparisons of favoritism; the rabbit is bidden to assess the nature of reality; his best friend is stricken with a possible fatal disease; he is replaced by another toy and sentenced to death; he gets a reprieve but has to live in a new and foreign environment (hippity hopping may not have been his first choice! ); the boy returns and doesn’t recognize him. Somehow the story doesn’t seem suitable for five year olds who just might start to speculate about faith and death and ill fate and loss of friendship far before their time. I can see how adults might ooh and aah over the heartrending lessons of life. And frankly, at this stage, I actually find it charming and dear. But even now as I review the story line I feel that old fear and negation surface. I revisit my childhood apprehension as if it were yesterday. 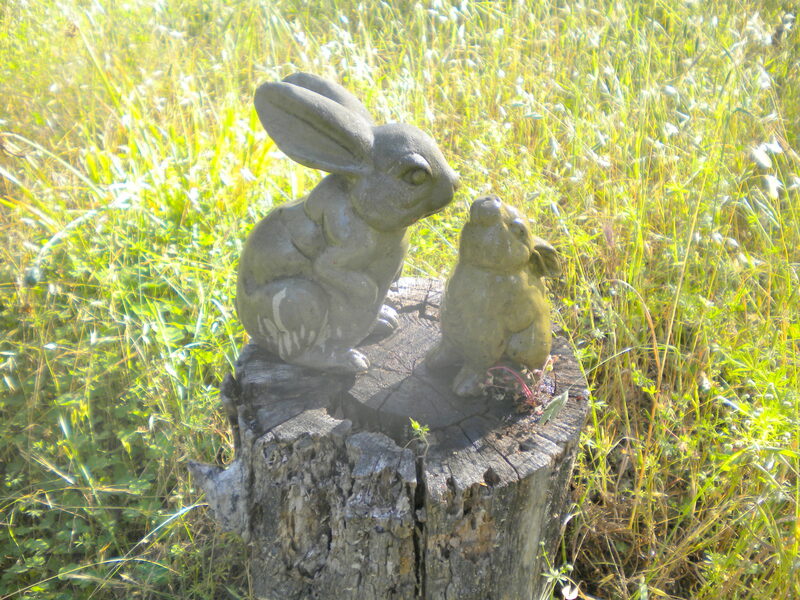 Bunnies were a major symbol and totem throughout my mother’s life. 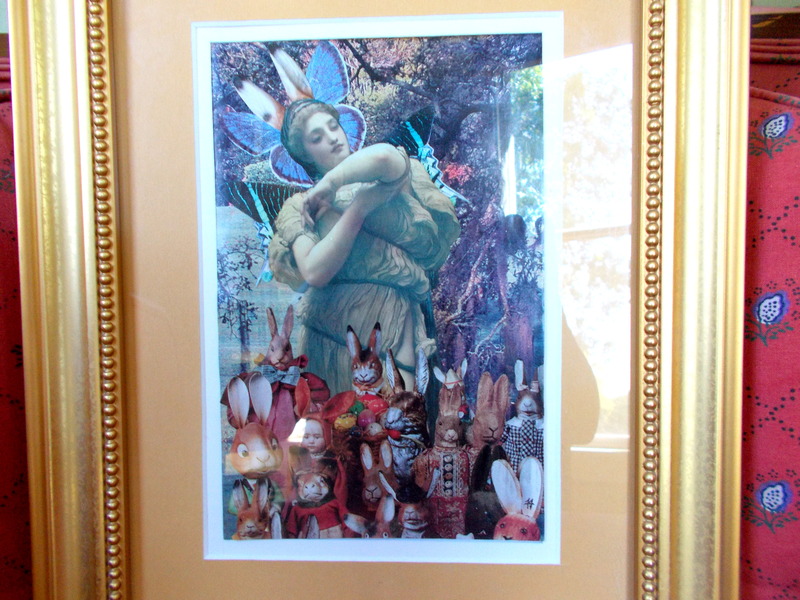 Her lawn ornaments became the spot that my daughter and I scattered some of her ashes – the very place where she watched from her window, the daffodils blooming in the spring. My son created a collage of bunnies just for her. 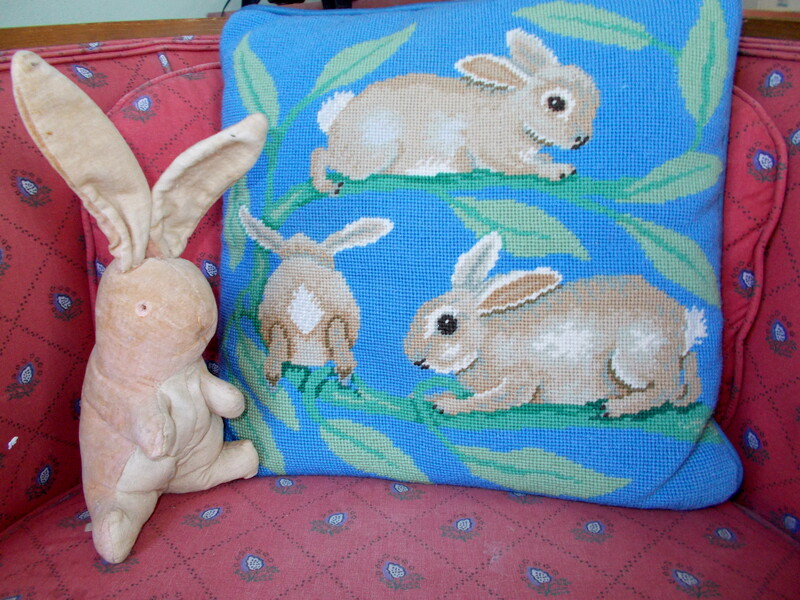 When I went through a phase of needlepointing some years ago, I made her a pillow with rabbits circling round and round. 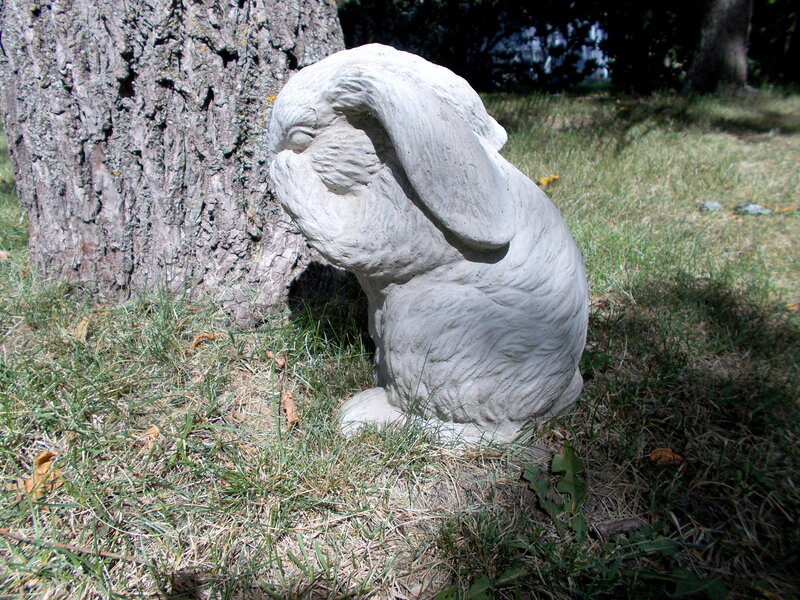 And the bunny sculpture that used to grace her front door, now sits in welcome at the foot of my hammock in Minnesota. As a gardener I have lumped the local garden rabbit along with all the usual suspects – the chipmunks and deer and rose slugs and gophers, the ground squirrels and aphids and raccoons and beetles. To name a few. I am interested in preserving all that I have painstakingly planted. It’s true that the bunny ate a bit of the cabbage leaves and the last of the kale and yet, perhaps it’s in my genes, but there is a difference in my heart and mind where he is concerned. I have admitted in the past my fondness for “Watership Down” and the fact that I believe the White Rabbit to be Lewis Carroll’s best character invention and yes, I rooted for Peter over Mr. McGregor. I expect to find a spectacular basket each Easter filled primarily with See’s Bordeaux and Scotchmallows. Thank you very much. All this past summer I have walked down the drive each morning in order to retrieve the morning paper and as I passed by the front garden the bunny would be munching spilled over sunflower seeds beneath the bird feeder. “Hi bunny. I see you,” I would sing-song as he froze in place, ears alert and eyes glancing sidewise. No running, just a wary apprehension. We had our respective roles and dynamics and so it went. One day last week he wasn’t on the grass in his appointed spot and when I got to the mail box I noticed a small grey-brown lump in the middle of the street. 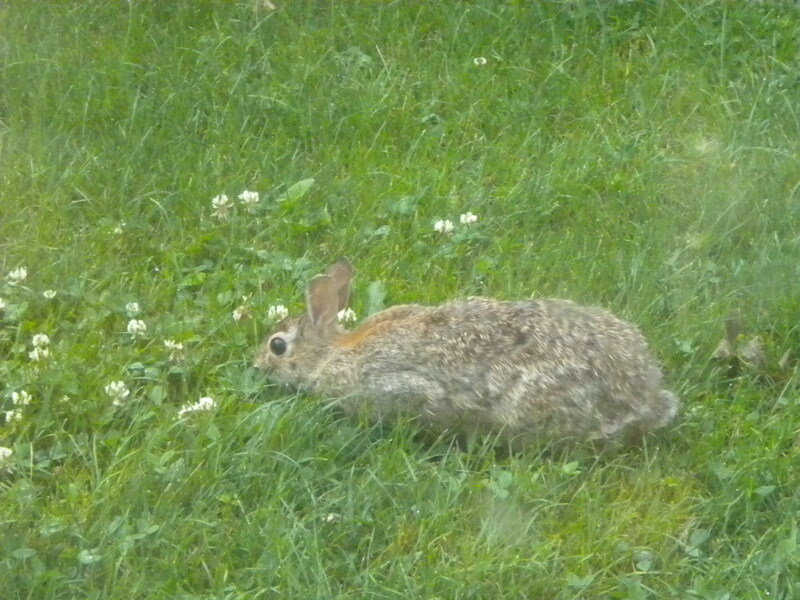 The bunny was lying on his side as if he was taking a nap, all four legs extending forward. There were no marks of violence, no sense of disarray, no intimation of struggle. This entry was posted in Family, favorite things, Gardening, In Memorium, Wild Life, writing. Bookmark the permalink.